Art will be in full bloom at the Gallery during the month of May! A group of Gallery artists will be displaying their art in all kinds of mediums, welcoming Spring with open arms. Shed your cabin fever! 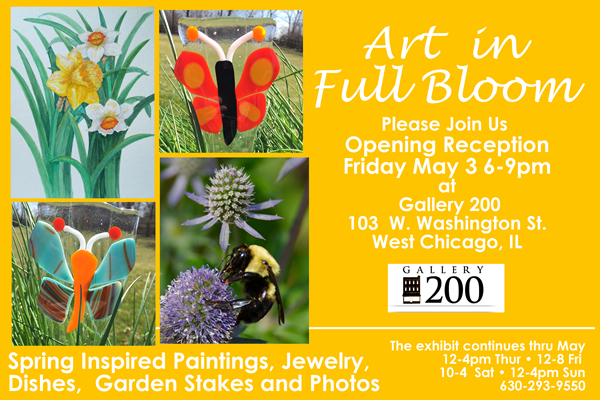 Come and see what Gallery 200 artists have been creating in anticipation of Spring and the West Chicago “Year of the Butterfly”. Enjoy refreshments and meet the artists at the opening reception. There will be activities and refreshments during the West Chicago Blooming Fest on May 18. Visit the exhibit during regular opening hours during the month of May.